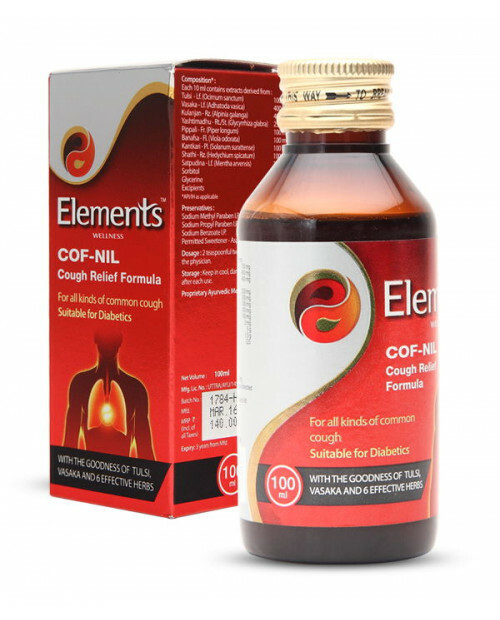 With Elements Cof-Nil, fighting cold is now much easier. The tonic contains some of the very effective herbs like Vasaka, Tulsi, Banafsha, Kantakari and Yashti that helps in soothing and anti-allergic activities. The tonic is mildly flavoured with mint and helps easing phlegm and reduces coughing to a great extended without causing drowsiness to the user. Additionally, this Ayurvedic Cough syrup is utterly safe to take without causing any side effects and also, keeps you active around the clock despite cold.